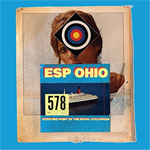 Original Release Notes: Like a long-lost artifact from some golden age of rock that never existed, ESP Ohio's debut album grabs the ear-holes and demands immediate and undivided attention. Robert Pollard says it's a band, rather than a collaboration - a distinction which may seem like splitting hairs, but rather than putting melodies and lyrics on top of other people's instrumentals, Pollard wrote these songs and sent them off to Brooklyn-based bandmates Doug Gillard, Mark Shue, and Travis Harrison to be fleshed out and then returned to him for vocal recording and mixing in the Buckeye State. Instead of fitting words and melodies around someone else's musical structure, he created the musical structure to fit his words and melodies. Also, there's a band photo. It makes a difference - Starting Point harkens back to Isolation Drills-era Guided By Voices, perhaps inevitably because Doug Gillard is playing guitar and contributing arrangements the way he did in that era of GBV, but this debut has its own unique characteristics as well. The result is some of the most joyful noise Pollard has made in recent memory: melodic, playful, upbeat, and ... what's the word� sparkly? Sure - call it sparkle rock - a mix of bold-faced rock with weirdo proggy-psych elements and textures. Pollard won't say whether this is a one-off or the first of a series, but he's keeping the door open. Maybe that's a key to his "process": always keep the door open. After countless songs, records, bands, line-ups, accolades, bottles of tequila� after everything, the door to the porches of Pollard's ears (this is an awkward and inappropriate allusion to Hamlet) remain open to the far-out whispers of his muse.